King Tut's 24-pound solid gold burial mask has become a symbol for Egyptology. In November of 1922, British archaeologist Howard Carter discovered the sealed tomb of ancient Egyptian Pharaoh Tutankhamen, or "King Tut" as he came to be known. Carter meticulously recorded and described each of the thousands of artifacts found within the most intact ancient tomb ever revealed. His discovery made him a worldwide sensation and ignited interest in Egyptian archaeology. Despite modern criticism of his methods, Egyptologists continue to study and learn from Carter's rare find. 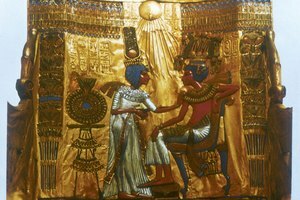 Tutankhamen was just a child when he ascended the throne in 1333 B.C. After ruling for just a decade, he died between 18 and 19 years of age. His short reign didn't leave much of a mark on Egyptian history, and when later rulers publicly condemned their predecessors they destroyed many related records -- including any identification of the location of Tutankhamen's tomb. Howard Carter first arrived in Egypt in 1891 and began excavating in the Valley of the Kings. However, most experts of the time believed all the royal tombs of any significance had already been found. Typically, any artifacts of any significance had already been removed by ancient grave robbers. Carter continued his methodical mapping and excavations undaunted. Carter's initial discovery of King Tut's tomb happened when an Egyptian boy Carter had hired to keep his team supplied with water accidentally uncovered the top of a stone step. Tut's tomb had been built over within a few generations of his death and ancient records didn't reveal its location. However, the boy found the stairs leading to its entrance while digging a hole in the sand to bury the water jars he'd brought. 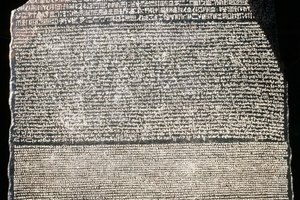 Although this led to descriptions that Carter had merely stumbled upon the tomb, in reality he had spent decades mapping and excavating the burial sites in the Valley of the Kings. His methodical study of the landscape and climate of the area helped him isolate ideal locations for ancient tombs. As Carter excavated the site, the initial rooms at the entrance proved barren. Later study revealed King Tut's tomb had been robbed at least once, if not twice. 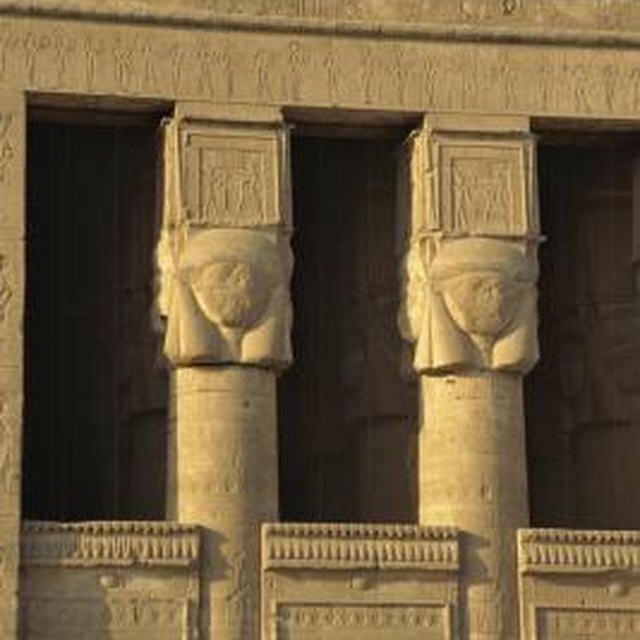 However, those ancient raiders had been caught before they reached the interior of the tomb, and the door to the child pharaoh's final resting place remained sealed, as it had been for more than 3,000 years. As Carter opened the door and made his first peek into a place no one had seen since ancient times, he was asked if he could see anything. "Yes," he replied. "Wonderful things." Carter meticulously described, photographed and sketched each of the more than 5,000 artifacts crammed from floor to ceiling in the interior rooms of the tomb. 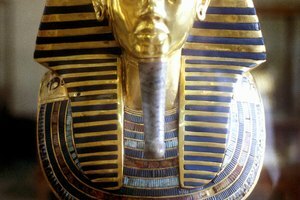 Artifacts removed from King Tut's tomb included statues, jewelry, furniture, clothing, weapons and chariots. 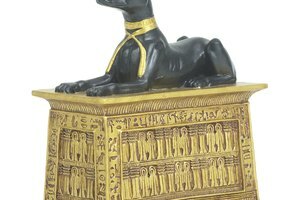 These treasures provided more evidence of the culture and history of ancient Egypt than had ever been discovered. The most impressive find, however, was a stone sarcophagus with three layers of coffins nested within each other. 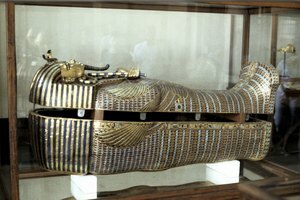 The final coffin revealed the mummified remains of King Tut himself, preserved for thousands of years. 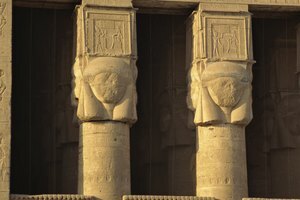 Despite damage Carter inflicted on the remains attempting to remove them, archaeologists still study them using DNA and scanning techniques to learn more about the ancient pharaoh. Carter published a three-volume study of the material found, and his extensive notes, drawings and maps remain available for public study at Oxford University's Griffith Institute. Millions attended a "Treasures of Tutankhamen" exhibition that toured U.S. cities from 1972 to 1979 with 50 artifacts from the tomb. Mueller, Jennifer. "What Did Howard Carter Discover in 1922 and What Made It so Important to the Study of Ancient Egypt?" Synonym, https://classroom.synonym.com/did-howard-carter-discover-1922-made-important-study-ancient-egypt-18078.html. Accessed 21 April 2019.